Kerger at the PBS Annual Meeting Tuesday. 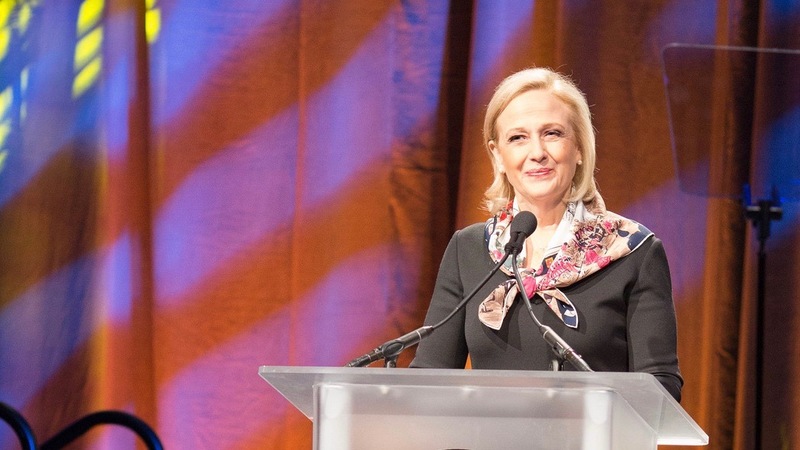 PBS President Paula Kerger delivered the following keynote speech Tuesday at the PBS Annual Meeting in San Diego. These are her remarks as prepared. Believe it or not, this is my 12th address at Annual Meeting, and I am honored to again stand before this incredible group of leaders. When it comes to public media, the whole is much greater than the sum of our parts. We are much more than a system — we are a family. And this is our reunion. Each year we gather to chart our course forward and discuss how, working together, we will continue to deliver on our special mission for the American people. Before we look to the future, let’s pause for a moment and reflect on where we’ve been. It was truly a banner year full of extraordinary accomplishment and exceptional content, and there is much to celebrate — including milestones reached across our system. Over the past several months, I’ve had the pleasure of joining local stations in celebrating 40 years, 50 years, even 60 years of service to their communities. As we commemorate the wonderful legacy of these stations, we also mark a historic milestone for public media writ large. President Johnson announced this grand endeavor in a commencement speech to the University of Michigan class of 1964. The challenge of the next half-century is whether we have the wisdom to use wealth to enrich and elevate our national life and to advance the quality of our American civilization. … We have the opportunity to move not only toward the rich society and the powerful society but upward to the Great Society. My memories of Lyndon Johnson were shaped through my eyes as a child and largely eclipsed by the Vietnam War. I missed Johnson’s Great Society. A society in which every woman, man and child has equal opportunity to lead a life of achievement and fulfillment; a society in which the invisible forces that divide Americans are replaced by forces that unite us. It wasn’t until later in life, as I reflected on that period in time, that I fully understood the totality of what President Johnson was trying to accomplish and how public media fit into his vision. President Johnson saw the potential in media as a force for good in America — the potential in media to strengthen communities and bring meaning and hope to people’s lives. In the decades since, America has moved, albeit unevenly, toward realizing Johnson’s vision of a Great Society. Throughout this time, however, I believe that public media has fully lived up to its immense potential. The fruits of our labor can be found in the hearts and minds of the American public, and the fabric of our work is woven into communities in every corner of this country. It is from this bedrock foundation that we contemplate the future. On the cusp of the Public Broadcasting Act’s 50th anniversary, as we consider the role of public media for the next half century, we take stock of a very different landscape than existed when President Johnson put his signing pen to paper. We operate in one of the most complex and rapidly evolving industries, but in my more than two decades working in public media, this is the most dynamic time I’ve ever encountered. I’m sure many of you feel the same way. Consumer patterns are constantly changing as new products and services become available. So-called “peak TV” has not yet reached its peak — the market continues to churn out seemingly limitless content. And changes in technology infrastructure and broadcast standards will impact how we reach audiences long into the future. As a backdrop to these complexities, we face an existential threat to public media, amid the prospect of diminished federal support. During times like these, it would be tempting to take the safe path, to maintain the status quo and hope for the winds to change. But that is not in our DNA. It wasn’t by taking the safe path that public broadcasting thrived throughout the past half-century. It wasn’t by hunkering down that we went from being the 15th most-watched network to number six in the last ten years. And it certainly wasn’t by fear that we launched a 24/7 PBS Kids service in the face of a competitive and complicated media landscape. At last year’s Annual Meeting, I said that for public media to thrive in this new age, we must focus on high-quality content, redefine localism in the digital era, and put education at the center of our work. These goals came together beautifully through PBS Kids 24/7. The 24/7 service began with a simple idea – to make our high-quality educational content accessible to all of our nation’s children, especially those in underserved communities. We spent lots of time talking to stations to get a sense of the community need, and we looked at reams of research demonstrating that we were missing an opportunity to serve families most effectively, because PBS Kids wasn’t always available when they were tuning in. From the earliest stages, we brought everyone around the table with the shared goal of building a localized, multiplatform service that would meet the needs of all families. And I am really proud that the service is centered on over-the-air broadcast television. Cross-system collaboration was present all the way from conception to execution — one shared goal, one shared strategy. Thanks to the enthusiastic adoption by stations — and the leadership of many of you — the livestream is available to every family who has access to the internet, and the broadcast channel will be available to nearly 95 percent of U.S. television households by the end of this year. We’ve already seen an impressive response in over-the-air-viewership and digital engagement. And the data has borne out our original premise: Viewing of PBS Kids on linear and digital platforms increased the most during evenings and weekends, when our content was not previously available. PBS Kids 24/7 serves as a model of what a unified broadcast and digital experience can be and reinforces the unique position we hold in the media landscape. Sometimes I will answer that question with my own. Who else would launch a new channel for the sole purpose of nurturing our nation’s children? Who else is committed to serving the one in five households that do not have cable, or the 16 percent that lack broadband? When you think about last fall’s election, millions of Americans were sending a message — they were feeling left out and left behind. Those are some of the very same people who rely on public broadcasting as a lifeline and as a connection to a brighter future. Not only is our work irreplaceable, I believe the services we provide are needed now more than ever — in this era of growing inequality, and this time of deep division. Public broadcasting is the only media organization that does not separate audiences into categories based on who they are, where they live or what they believe. We are the people’s network. We provide a space for Americans of all backgrounds to come together for meaningful conversation, without hyperbole and without rancor. We gathered communities for important discussions around shootings in Newtown, Ferguson and Charleston. We provided in-depth coverage to inform and educate citizens during last fall’s election. And we will bring people together again around Ken Burns’ and Lynn Novick’s The Vietnam War. More than four decades after the end of the war, it continues to serve as a flashpoint in American history, and there are dimensions to the war and its effects on our society that have yet to be uncovered. Local stations have already begun to leverage the film to foster dialogue, and many of you have helped veterans share their stories. For some veterans, this is the first time they’ve been willing to talk about their experience since they returned home. Public broadcasting was born during the height of conflict during the Vietnam War, which may partially explain why it is so innate to our core to find common ground on even the most divisive issues. It also explains our relentless quest for getting at the truth. Simply put, our country needs us right now — to understand our past, to inform our present and to point the way to a brighter future. PBS and stations together form a trusted institution that has the power to bring our country together. We do it every day — from our children’s educational programming that every family can rely on to the public-affairs programs that turn down the noise and create a space for civil discourse. At a time when some are questioning the value of public media, the audience that truly matters — the American public — is clear in their unequivocal support for PBS and local stations. There are inspiring voices all around us, voices that are rising up in communities across the country. The coal miner who received a life-saving lung transplant after West Virginia Public Broadcasting shared his story; the grandmother whose kids are going to bed learning and waking up learning thanks to Alabama Public Television’s PBS Kids 24/7 channel. While I’ve heard many powerful stories, there is one that stays with me throughout each and every day. In March, when we celebrated Fred Rogers’ birthday, a woman named Bobbi Craighead Hancock posted this message on Facebook. I grew up in poor, rural Appalachia. My father was an alcoholic. Mister Rogers was the first man I knew who talked calmly and quietly about real things. I married an engineer. I’m an author. My oldest son is a biologist. My twins are studying to become a doctor and physicist. All because of the difference PBS and Mister Rogers made in the life of a child who was hungry for more than the gloom she knew. This story was shared 8,200 times on Facebook, reaching over 1.2 million people. People believe that the public broadcasting service belongs to the public — the same way they feel about public libraries, public parks and the public square. And they feel a strong bond with their local station. As you know, this year we find ourselves once again having to defend our value and make our case on Capitol Hill. As we enter this national debate, we carry with us countless stories like the ones I just shared — stories rooted in a 50-year legacy of service to the American people. And we walk in the footsteps of leaders who paved the way. This year we lost several giants in our field, people who individually and collectively left an indelible mark on public broadcasting. People such as Glenn Dubose, the legendary arts producer, who after an accomplished career came out of retirement to help us take the PBS Arts Fall Festival from vision to reality. Gwen Ifill, one of the leading forces in journalism, remains a fundamental reason that public media garners tremendous support from people of all beliefs. She reminds us that our job is to bring the light, not the heat, to issues of importance in our society. My personal mentor Ward Chamberlin, one of the founders of public broadcasting, laid the groundwork for this great system and later went on to apply his leadership and his love for people through his work at WETA, WNET and beyond. And Beverly Lundquist, who passed away just two weeks ago, tirelessly led The Friends of Public Broadcasting and fearlessly traveled the halls of Congress making the case for federal funding. We owe so much to the people on this screen, our beloved colleagues and friends who dedicated themselves to our mission and to our country. As we move forward, we continue to look to them for inspiration, and we honor them by building on the tremendous legacy that they leave behind. Please join me for a moment in silence in their memory. Every year when we gather at Annual Meeting, it feels like the most significant moment in time, but I truly believe that this is an extraordinary moment — an inflection moment — for public broadcasting. A couple months ago, I participated in a planning activity with the Strategic Planning Group of the PBS Board. In order to plan for the future, we envisioned two possible scenarios that could play out three years from now. The first scenario involved many of us sitting around a bar lamenting the demise of public broadcasting. In the second scenario, public broadcasting remained a vital and valued service to the American public. We talked about what could lead to these two very different outcomes. In the first scenario, we acted out of fear and from a position of defense, and we became entangled by infighting and small grievances. In the second, we rallied together, and we used this moment to assert who we are, to reaffirm our value to America, and cement our legacy for generations to come. I, for one, haven’t dedicated so much of my career to witness the demise of public broadcasting, and I know that you feel the same way. Over these next three days, and long after we leave this meeting, let us rededicate ourselves to fulfill the hopes and dreams of the American people. Let us fight aggressively to retain our funding, while we aggressively seek out new revenue streams. Let us be bold, not shy, investing in content that makes a difference in the lives of women, men and children who hail from every walk of life. Let us stand strong with our friends at NEA and NEH as we preserve the cultural heritage of our country. Let us explore every channel, every device and every platform that connect us to the American public. And let us build on the wonderful legacy to which we were entrusted. Public broadcasting isn’t just a part of the Great Society as it was originally envisioned. In fact, we are essential to creating that Great Society. Working together, I believe that we can make the bold dream that President Johnson so perfectly articulated a reality. “The time is right to re-examine basic assumptions about public media and to ask, anew, essential questions,” writes an outgoing CPB board member. Very interesting and profound. ???? But keep public television alive!!! ???????? We ???? love PBS!! !